Congratulations! Your LinkedIn profile is *sparkling*! 1. Recent LinkedIn tips on new topics (our latest writing). 2. 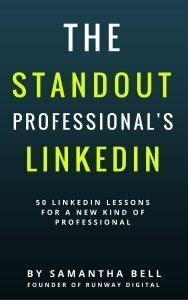 LinkedIn status ideas and examples are here. 3. Use our LinkedIn cheatsheet – it’s a list with the top things to tweak on your LinkedIn. It’s free when you join our newsletter. 4. One of the ways I easily grew my LinkedIn to over 3,000 connections was through connecting my email with Rapportive. Each time I email someone new it shows me their LinkedIn profile, I click the ‘connect’ button to the right of the email and it does the rest. My email system is gmail (even though my email addresses don’t end with gmail.com) it’s great. I’ve also tried Full Contact and found Rapportive less distracting. 5. After events, get into the process of jumping into LinkedIn and finding people you enjoyed meeting and connecting for the future. 7. Connect with Sam and the Runway Digital crew on Linkedin – there may be introductions we can make to help you on your way! Feel free to get in touch with any queries or to let us know how you go! If you’d like to save time and gain specific tips for you and your industry, receive insight from having an Online Pilot review your profile – here’s how. Next up, expand your online ‘footprint’, setup a website, publish an eBook, ..all via our Online Flight Training. Sign up here. We’d love to see how you’re going! Show us your profile by including Sam or Runway Digital in a LinkedIn update, tweeting us (include #onlinepilots) at @sambe11 and @runwd or via Facebook. Looking great online saves time, increases work enjoyment and the quality of the services you provide.